London mayor Sadiq Khan has announced he has commissioned studies on how Brexit could impact on the city. The study will be based on Brexit scenarios, from continued membership of the single market and customs union, to leaving the EU on World Trade Organisation terms. 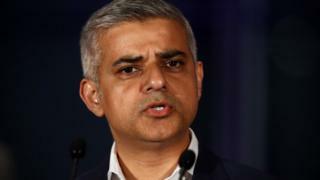 The Department for Exiting the European Union said it was a matter for the Mayor of London. It comes as Theresa May struck a deal with the EU to advance talks. The analysis will be published next month. Did 'soft Brexit' just win? The report, commissioned from consultancy Cambridge Econometrics, will cover nine sectors of the economy in London and across the UK. These include financial and professional services, construction, the hospitality sectors, as well as science and technology. Brexit secretary David Davis has come in for criticism from MPs for failing to complete impact assessments of Brexit on the economy. Sadiq Khan said: "It is outrageous that the government either failed to properly consider the impact of Brexit on Britain's economy, or are refusing to release their analysis. "If it's the former, then I question their competence. If it is the latter, then I question whether they have something to hide." This new work with the imprimatur of City Hall will be designed to keep the pressure on government. Analysis of key sectors - financial and professional, construction, hospitality, science and technology - should at least bring us bang up to date in the capital as the government embarks on stage two of the withdrawal process and negotiations on a future trading relationship. There will be particular focus - and almost certainly concern raised - on the shape and impact of future restrictions on migration. The guarantees extended to EU citizens currently here has been welcomed by business groups as a crucial soothing measure - but the bigger questions lie ahead. In terms of general freedom to trade, what should also be laid bare are the different outcomes possible depending on the pace and grace of the exit. What will be the latest evidence on the potential impact of new regulations or restrictions on businesses? It is said the studies will show the impact on many people who work in cities across the UK, employed by companies which "anchor" themselves in London. The mayor says the government has done too little so far to show the economic impact of Brexit. Let's see how authoritative his own commissioned assessments turn out to be. A spokesperson for the Department for Exiting the European Union said: "We have conducted a thorough and comprehensive programme of analysis, and are working hard to deliver a deal that works for the whole of the UK, including London." Anand Menon, director of independent think tank UK in a Changing Europe said: "There is far too much playing of the man not the ball with Brexit. If people are opposed to the results of these studies, let's hear exactly why." BBC has contacted Cambridge Econometrics for a response.